This browser cannot play the embedded audio file. Sing, O my tongue, of the battle, of the glorious struggle; and over the trophy of the Cross proclaim the noble triumph; tell how the redeemer of the world won victory through his sacrifice. The Creator looked on sadly as the first man, our forefather, was deceived, and as he fell into the snare of death, taking a bite of the lethal fruit; it was then that God chose this blessed piece of wood to destroy the other tree’s curse. to outwit the resourceful craftiness of the Traitor and to obtain our remedy from the very weapon with which our enemy struck. And so, when the fullness of that blessed time had come, the Son, the Creator of the world, was sent from the throne of the Father; and, having become flesh, he came forth from the womb of a Virgin. When six times five years had passed, at the end of his earthly life, he willingly gave himself up to the Passion; it was for this that he was born. The Lamb was lifted up onto a cross, offered in sacrifice on wood. Equal and eternal glory to the Father and to the Son and to the illustrious Paraclete, the Blessed Trinity whose divine grace redeems and conserves us always. Amen. Note: The above music is from the Parish Book of Chant from the hymn “Crux fidelis" (CMAA, 2012, p 267) and used with permission from The Church Music Association of America. Book can be purchased at amazon.com and is also available by download from http://media.musicasacra.com/pdf/pbc-web.pdf The Latin text is from the Liber Hymnarius (Abbaye Saint-Pierre de Solesmes, 1998, page 61) and used with permission from The Abbaye Saint-Pierre, Solesmes, France. 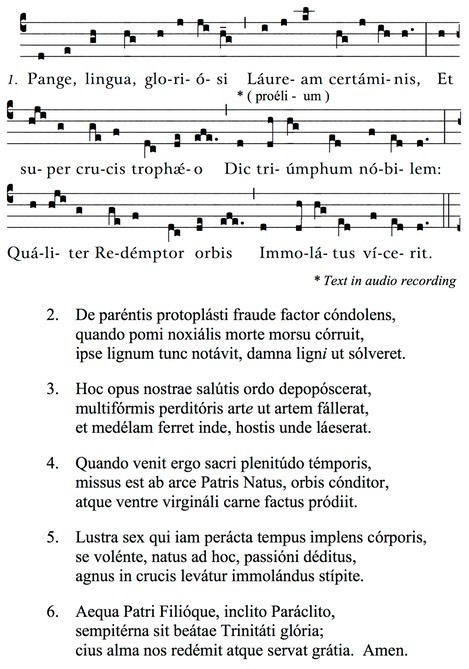 To obtain the music with updated words and notation, please purchase the Liber Hymnarius ( solesmes.com ).